I would love a bracelet... but what shall I get? That's the fun part! Think about why you want one. A special date? That perfect dress needs something. Perhaps you are considering a gift for your best friend. What are her favorite colors? Does she have a favorite gemstone? Does mom like the rich green of Malachite with the sheen of sterling silver? Maybe you just want a pearl bracelet accented with gold. Whatever you're thinking about, feel free to contact me; together we can create that perfect piece! Okay, you mentioned pearls. What other beads and gemstones do you use? I use many different gemstones. Just about all of them. Almost all gem sizes stay between 3-5mm. 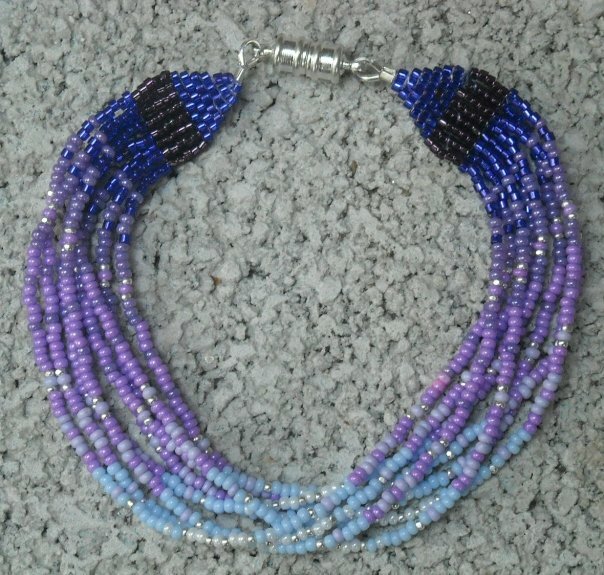 Anything larger and the beads simply don't form a good solid pattern. 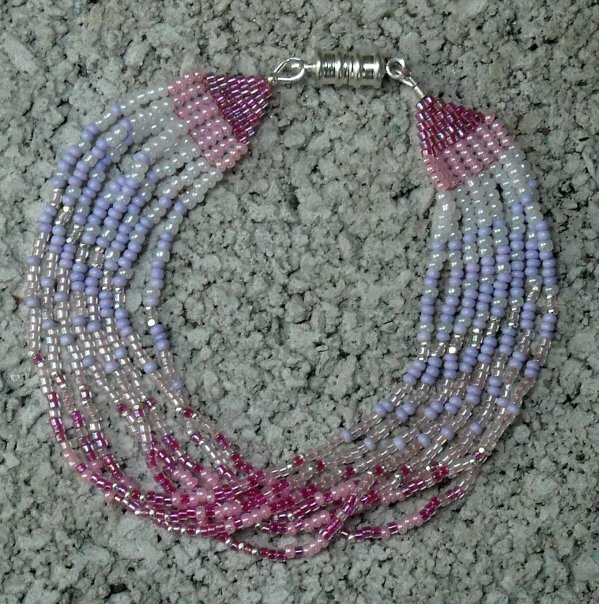 I use seed beads in every color, ranging in size 8/o (a fairly large bead) to the tiniest 15/0, which barely fits on the head of a sewing needle. 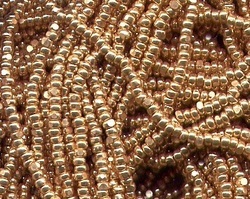 Sterling silver and 14 & 24 karat gold plated seed beads and Charlotte beads. What are Charlotte beads? Let me show you! 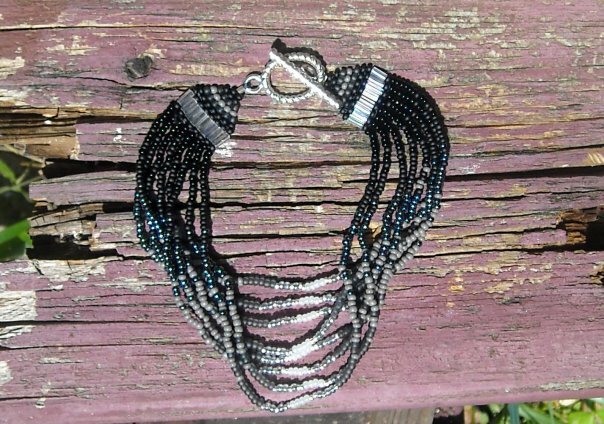 Charlotte or 'True Cuts' are seed beads that range in size from 11/o (the most widely used size of seed bead) to the tiniest 15/o. 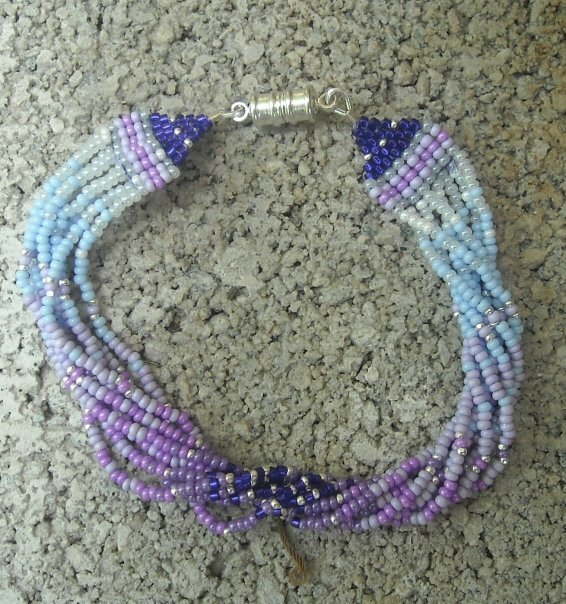 What makes these beads so unique is that every single bead has a side that is basically sliced off, making them shine brilliantly. They are very uniform in size which makes them the perfect bead for enhancing gemstones. The sparkle from these babies is intense. What about crystals? You mentioned Swarovski®. Do you really use those? I sure do! It's the only brand of crystal I use! I use 4mm bi-cone crystals, but can also incorporate their round crystals up to 5mm. Swarovski® offers many colors and many finishes on their crystals so you can truly be unique in choosing what colors you want! Choose one color or many colors. The choice is yours! Below is the official Swarovski® color chart. Wow! I love those colors... but my birthstone is a diamond. Okay, I confess; I don't use diamonds! I wish I could! Don't worry, we can still do this! Below is the official Swarovski® birthstone chart! Whenever possible, I can certainly try to use your true birthstone. How I Measure My Wrist? It is very important know your correct wrist size. When you order a bracelet from me, I want it to fit you properly! These simple instructions tell you how to measure your wrist properly so you can be sure your bracelets will fit right. Using a flexible measuring tape*, Measure just above the wrist bone (That pointy bone on the pinkie end of your hand), then add 1/4" to 1 " (1/2" is average) depending on how tight you like your bracelets to fit. That is the size bracelet you would wear. If you don't have a tape measure handy, use a strip of paper or thin string, and mark it where it overlaps on your wrist. Then lay the strip flat to measure up to the mark using any ruler. Red Velvet (The do look just like red velvet!) Chinese glass beads, Swarovski 4mm bi-cone beads and 14kg plated seeds. 4mm freshwater pearls, 4mm Chinese Glass beads, 14kg plated seed beads. You mentioned Swarovski® pearls? They make pearls, too? Well, yes, and no. They make glass pearls. Sometimes glass pearls simply work better in my patterns. They are very strong and durable, just like the real things, but at a fraction of the cost. If you need the real things, we can do that, too! Here is the official Swarovski® Glass Pearls color chart. Tila Beads? What on Earth are those? What else makes your jewelry so special? I only use the finest stringing materials. Fireline 6 lb test is the strongest bead stringing material you can buy. I want your bracelet to last a lifetime! I truly love making jewelry. I don't consider it work. When I am making your jewelry, know that I am doing all I can to make you a gorgeous piece and that I --being a perfectionist-- will not sell anything that is not made with the best quality beads, gemstones, findings and is made with love and care.